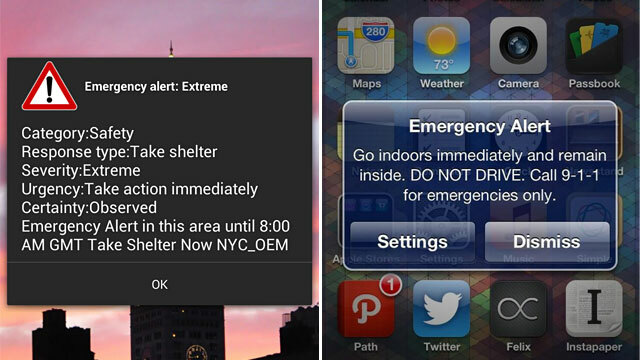 During Hurricane Sandy, Wireless Emergency Alerts appear on the Verizon Galaxy Nexus and iPhone 5. During the worst of Hurricane Sandy, just moments before the storm was about to make landfall, many in the affected states heard a noise over the wind and the rain. It came from their smartphone. For some, it was a loud buzzing with an emergency alert image, explaining that they should take shelter. For others, it was actually a female robotic voice, informing them of an emergency. Those notifications were what FEMA and the FCC call wireless emergency alerts or WEAs. They were designed to alert people via their phones about three types of emergencies -- imminent threats (including extreme or severe weather), AMBER alerts, and presidential alerts (alerts issued by the president). The alerts, which are not done via text message, were launched last year in many parts of the country and in May came to AT&T, Verizon, Sprint and other carriers. "We have close to 100 carriers that are providing the service," Chris Guttman-McCabe, vice president, regulatory affairs for the CTIA, the wireless industry trade group, told ABC News. "We purposely made it so people didn't have to sign up for the service. We worked with FEMA and others to make sure it doesn't get abused. That's when people will only really pay attention to it." Guttman-McCabe said that users can disable the imminent and AMBER alerts, but not the presidential ones. The alerts are not text message-based by design. "WEA messages ensure that emergency alerts will not be delayed by network congestion, which can happen with standard mobile voice and texting services," a FEMA spokesperson told ABC News. But that means that they are also dependent on the carriers and the phones. "It's a technology upgrade," Guttman-McCabe said. "As new phones come out, there is extreme likelihood that they can receive these." Most of the phones that are supported are smartphones; not older-style flip or clamshell phones. Currently, Verizon supports at least 35 phones, including the iPhone and some of the recent Android phones, like the Galaxy Nexus and Galaxy S III. Verizon lists the phones on its website, though is missing some of the newest phones that support the service. The iPhone is also missing from that list, but ABC News confirmed that the iPhone 4S and 5 on Verizon's network got alerts during the storm. AT&T, by comparison, only supports 11 phones. On the flipside, AT&T's iPhone 4S and iPhone 5 do not support the service. An AT&T spokesperson confirmed to ABC News that AT&T's LTE network does not currently support WEAs. Sprint, like Verizon, also has a wide selection of phones. In fact, all the smartphones on the network released since 2011 support WEAs. Apple also confirmed to ABC News that only Verizon and Sprint support the alert function, at the moment. Apple added the WEA alert option in iOS 6. You can turn on the feature under the settings and then the notifications menus on the phone. The feature is also supported on Android smartphones and is enabled automatically on many of them. Google has even added alerts cards to its Google Now service. But Guttman-McCabe made it very clear: The goal is to have this service on all phones. "The goal is to get it out to as many people as we can," Guttman-McCabe said. "The percentage of people with access to the alerts will climb dramatically."